McGill alumnus Richard Hart (PhD’70, MBA’73) isn’t a big fan of thank-you cards when it comes to expressing his appreciation. He believes in something a little more substantial – as witnessed by his recent $1.2-million gift to create the Molson and Hilton Hart Fellowships in Science. The fellowships will recognize and promote the scholarship and academic achievements of graduate students in the Faculty of Science. “I came from New Zealand for doctoral studies in chemistry,” said Hart, explaining why he chose McGill over a number of other top universities. “McGill was very good to me,” he said. He credited generous support from Molson Breweries and the J.W. McConnell Family Foundation, as well as an NRC grant, with helping him get through the grueling pace of graduate studies. A long-time McGill volunteer, Hart is a founding member of the Faculty of Science Advisory Board (now the Science Campaign Committee). He received the Distinguished Service Award from the McGill Alumni Association in 2004. Hart’s generous gift helps keep the momentum going for Campaign McGill: History in the Making, which recently surpassed the $500-million mark on the way to its ambitious $750-million goal. 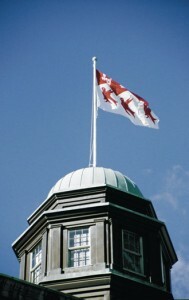 Publicly launched in October 2007, Campaign McGill is raising the funds needed to attract and retain the world’s best students and faculty, increase access to quality education, and enhance McGill’s ability to address such critical global challenges as sustainability, health and wellness, and global prosperity. Campaign McGill was launched with a $750-million target, at the time the largest starting goal in the history of Canadian universities.